We are officially celebrated an infamous anniversary. In case you stepped out from beneath a large boulder or were trapped in a cave recently you will recall that it was on this day last year that the BP Macondo exploded polluting countless miles of Gulf shoreline, the entirety of the deep and surfical waters, killing countless saltwater organisms from charismatic megafauna to the smallest of critters. However, what is the governor of Louisiana and neighboring Gulf states pushing for? You guessed it more frequent and intense drilling in the same unforgiving waters. I thought it would interesting to apply some of my dissertation data to figuring out how much of Detroit’s CO2 footprint could potentially be offset if this land was reforested. So, here it goes step by step. Metric Tons Per Year=1,288,896,240,464 g C m-2 yr-1*0.000001>1,288,896 Metric Tons of C captured Per Year IF the 45.87 Sq Miles of vacant or derelict land was reforested! NOW lets put this number in perspective relative to Detroit’s actual emissions. If we assume Detroit’s population (For Now!) is 951,270 and residents of the city emit approximately 23.4 Tons of CO2 per person per year that comes out to 22,260,764.4 Tons of CO2 per year for the city of Detroit, which means…….. The figure calculated above for potential carbon captured by reforestation of vacant and derelict land (i.e., 1,288,896 Tons of CO2 per year) equals 5.80% of total city-wide emissions. This number while not jaw dropping is far from trivial and any efforts to implement such plans should be encouraged locally and nationally as 5.8% of anything at that scale adds up and would greatly increase the quality of life in Detroit. Similar projects are sprouting up in neighboring F lint, Michigan as well as places as far off as Chilibre, Panama. Likewise we have data on those areas as well and could do similar BOTEs in an effort to quantify the impact of reforestation, both above- and belowground. We have an interesting love affair with shopping in this country and I thought it would be illustrative to quantify its influence on our land to capture carbon. 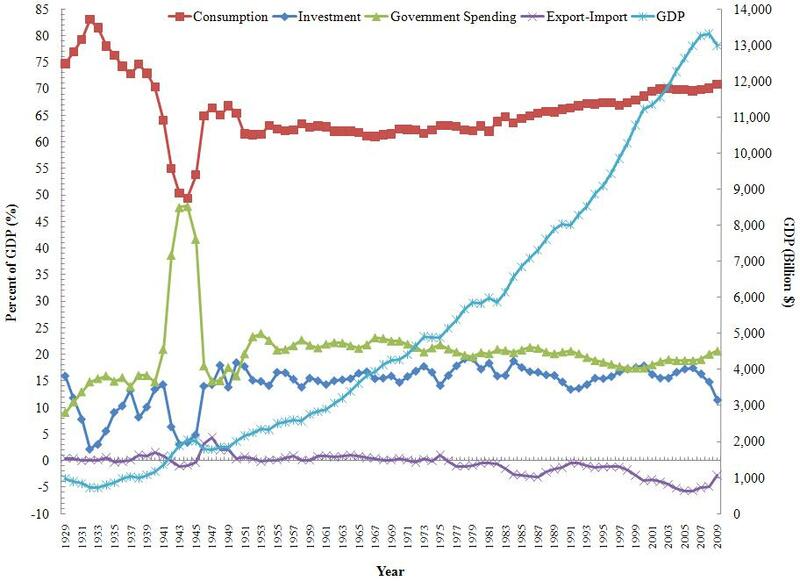 First lets quickly look at how much we love shopping and how much our economy (and by association China, Japan, the EU, etc etc) depend on our insatiable appetite for stuff. 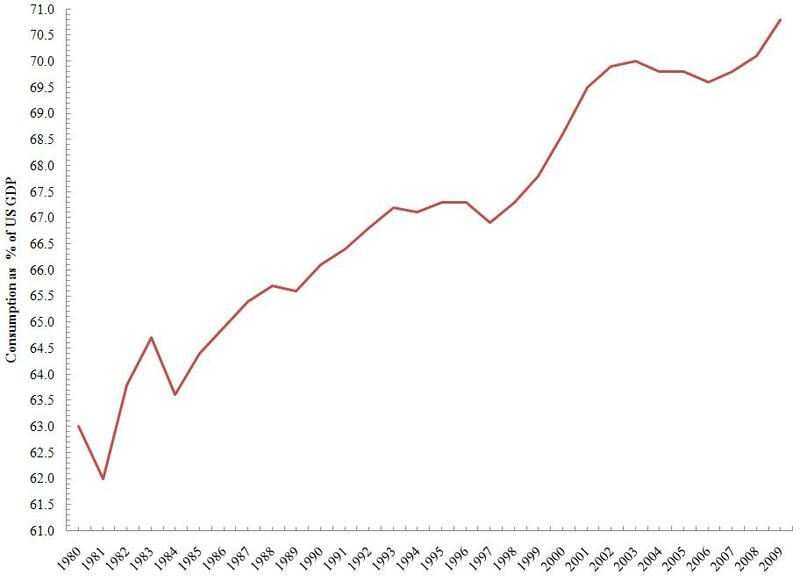 It is true that we have come down off our Great Depression high of 83% Consumption as a percent of GDP, but for the better part of the last 63 years we have maintained a relatively static 65% of GDP attributable to consumption. 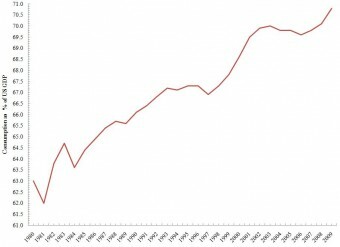 However, this figure has risen substantially in the last 20 years from 62% in 1981 to 70.8% in 2009. You might say well what does my local strip mall have to do with CO2? Well your local strip mall displaced some sort of native ecosystem that, up until the big trucks and earth-moving equipment came, was drawing down CO2 via photosynthesis and decomposition of biomass to produce soil carbon. Well that has had a cumulative effect and I have attached a couple of graphs to demonstrate this phenomenon. 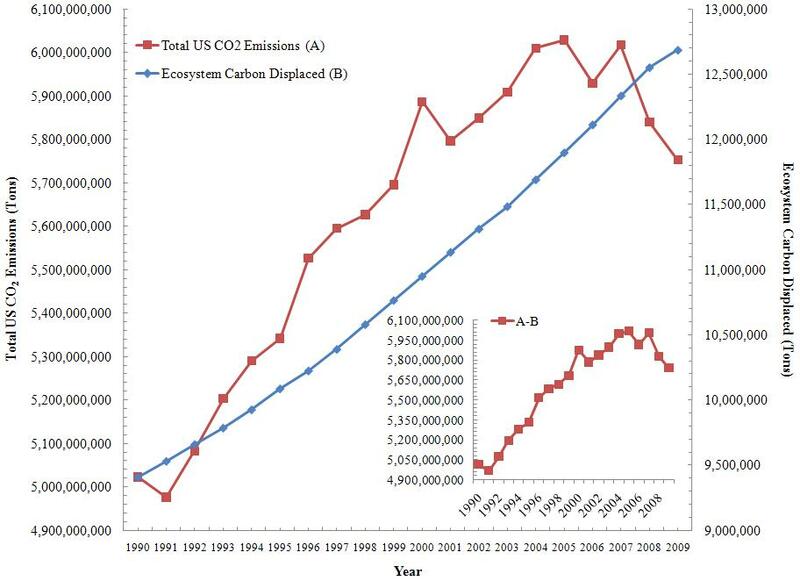 Using Gross Leasable Area (GLA in sq feet) per person data back to 1990 we can calculate above- and belowground carbon displacement via shopping center expansion (Blue Line), which sums to about 218 Million Metric Tons between 1990 and 2009, which when subtracted from Total US CO2 Emissions gives us the inset in the figure below. How you might ask does this relate in-terms of percentages? Well it turns out it is quite similar in magnitude to what I described for Detroit. 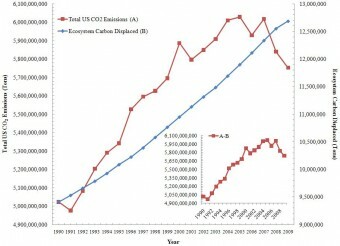 If we assume – based on EIA assumptions – that Residential emissions is 6.65% of the story here in the US with respect to CO2 emissions than the above removal of native ecosystems for shopping centers translates to anywhere from 2.78 to 3.31% of Residential CO2 emissions across the entire US. However, if we had implemented the type of plain they are considering in Detroit across all fifty states beginning in 2005 we would have had the opportunity to “offset” 3.13% of our emissions per year as opposed to 2.85% between 1990 and 2004. You may say what is the big deal about 2.85 to 3.13%? Well when you consider we are measuring our fiscal and monetary peril here in the US with values like 3 to 12% of GDP and the fact that US GDP is expected to grow by 3.0% in 2010 v. 0.18, a decline of 1.83, and 2.53% in 2009, 2008, and 2007, respectively…Then the numbers I present here start to take on a whole new meaning. The harm inflicted by shopping centers – never mind the removal of capital and liquidity from local markets via large multinationals like Wal-Mart and Best Buy – is not just skin or in this case soil surface deep. It impacts the ability of communities and watersheds to withstand flooding, retain nutrients that would otherwise pollute reservoirs and aquifers, moderate temperature and moisture volatility, and propagate a sense of ownership among residents. The data back it up. Chalk another one up for BOTEs! So it appears that Arizona successfully decoupled its laws from those of advanced society when Gov. Jan Brewer (R) signed into Law SB 1070 last Friday whose “…aim is to identify, prosecute and deport illegal immigrants.” The criteria police officers will use rely on something the law calls “reasonable suspicion”, which is about as big an umbrella category is you will find anywhere. Anyone with dark skin (THAT MEANS YOU JOHN BOEHNER!) will be forced to carry with them wherever they go documentation speaking to the validity of their residence in the United States. I find it amazing that the very same folks that pushed this bill out of one side of their mouth are on the other side accusing Barack Obama of being a Fascist. This DoubleSpeak is right out of George Orwell’s opus “Nineteen Eighty-Four” and is the type of rhetoric that has slowly but steadily been percolating up from right-wing hate groups since President Obama’s election. It is even creeping – overtly and covertly – into national politics with Pat Bertroche (R) vying for the 3rd District Congressional primary seat in Iowa noting that “I actually support microchipping them. I can microchip my dog so I can find it. Why can’t I microchip an illegal?” That’s very True Pat why don’t we just make a minor incision in everyone with dark skin, implant a microchip, and send them on their merry way. That makes complete sense and it doesn’t sound prima facie like it violates anyone’s human rights! 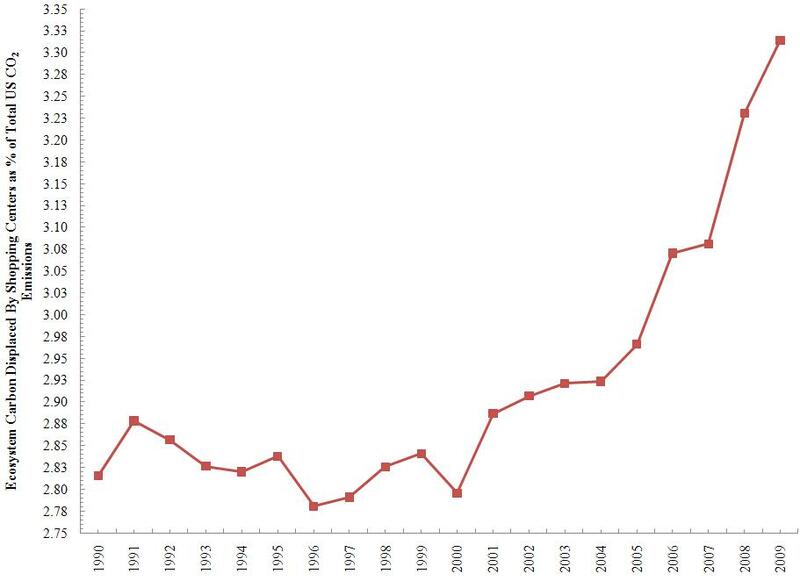 This uptick dovetails into The Southern Poverty Law Center’s documentation of mushrooming phenomena in their latest report “Rage on the Right”, which quantified a 244% increase in the number of “Patriot’ groups, from 149 in 2008 to 512 in 2009. 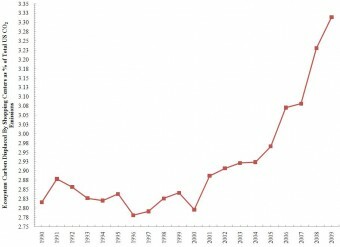 This came at the same time as racist hate groups rose from an all-time high of 926 to 932 in 2009 and “nativist extremist” groups – vigilante organizations that go beyond advocating strict immigration policy and actually confront or harass suspected immigrants – grew from 173 to 309 (+80%) between 2008 and 2009. This type of trend does not speak well for border states writ large. If Vermonters think that this type of sentiment will not rear its ugly head here with respect to Canadians in general and Québécoise specifically we’re fooling ourselves. The recent legal battle between the Rainsville’s of Franklin County and The Department of Homeland Security is in my opinion the opening salvo in a nascent fortification and potentially militarization of our border with Québéc. Janet Napolitano & Co. feel it is imperative that we fortify a crossing that experiences 2.5 cars an hour or 21,900 per year. If you consider that the monies allotted to this project amount to $5 million that averages out to $228 per car or with respect to the Rainville’s about 4.9 acres we’re talking about $1.02 million per acre. Either way you cut it I am sure Governor Douglas or his successor could find markedly more important things to do with this “stimulus”. For anyone interested in reading more about the Rainville matter I would refer you to Secretary Napolitano’s letter to Senator Leahy on March 10 of this year. Needless to say we are seeing a growing sense of paranoia and misguided attempts at securing 1,969 miles (3,169 km) of Mexican- and 5,525 miles (8,891 km) of Canada-US borderland. We should work hard here in Vermont to insure that the 90 mile border we share with Québéc never even faintly resembles what those in Arizona are trying to construct. After all it is not immigrants, illegal or otherwise, forcing US-based multinationals to outsource thousands of jobs under the guise of globalized capitalism. How about a little more job protectionism and a little less racism cloaked in pseudo-patriotism. 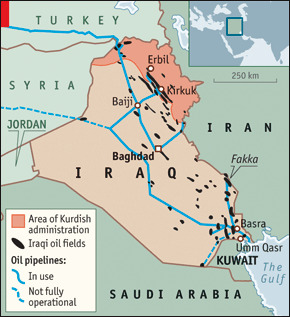 Quite simply the reply to this is that while Sunni v. Shia may be the short-term cyclical conflict of most importance it is clear from this reader’s perspective that the long-term structural problem is the Kurdish Northeast (Large concentrated oilfields) v. the predominantly Arab rest of Iraq (Small dispersed oilfields). The Trigger Line as this separation is known will prove a chronic issue and one that no amount of troops, drones, or Maliki/Obama DoubleSpeak will resolve. Just another great map from The Economist. Refer back to the map in a previous post regarding The Trigger Line as it is called in Iraq. Here it is essentially the line separating the Two Shades of Iraq. 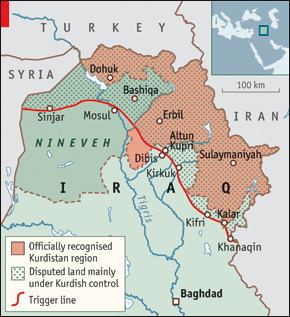 This is truely an informative and needed reminder of the nuanced divisions in Iraq. 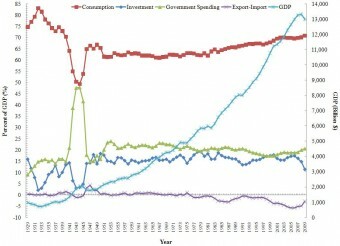 It is from The Economist (http://www.economist.com/world/middle-east/displaystory.cfm?story_id=15502375). The article basically is discussing the issues surrounding NE Kurdistan and the rest of the nation. The author discusses how the Kurdish v. Arab tussle may be of more long-term importance than Sunni v. Shiite, which is the classic struggle we hear about in the west. The Shiites being the party of El-Maliki. However, the Kurds in the NEastern section of the country guard what they call “The Trigger Line”, because they were burned by Saddam Hussein and feel as though with their oil riches Hallibur…Oops I mean Exxo…Kidding I meant El-Maliki wants desperately to divide and conquer the region. The article makes the point that with General Odierno et al leaving at the end of this summer it will be worth keeping an eye on “The Trigger Line”.